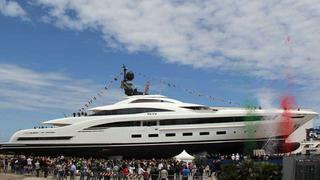 Italian yacht builder CRN has launched its 73m superyacht Yalla. CRN welcomed more than 1,000 guests to the launching ceremony of CRN 132 Yalla, held late this morning at its shipyard in Ancona, Italy. The launch ceremony included speeches from Alberto Galassi, new CEO of the Ferretti Group, Lamberto Tacoli, Chairman and CEO of CRN, Xinyu Xu, Vice-chairman of Weichai Group, and the Mayor of Ancona Valeria Mancinelli. Part of the Ferretti Group, CRN specialises in custom yachts up to 90 metres in steel and aluminium. Yalla is the first yacht built by CRN on its new 12.5m beam platform. More than 430,000 hours from CRN and its subcontractors were spent on Yalla's build, with contributions from 150 employees. Exterior styling comes from Omega Architects in The Netherlands, in close collaboration with the CRN Engineering Department. The five-deck motor yacht features sleek, sporty lines and a streamlined profile. Superyacht Yalla's interiors are by Droulers Architecture, working with CRN's Interiors and Design Office. She hosts up to 12 guests in its six cabins, including an owner's suite and VIP cabins, along with 22 crew members. The Ferretti Group currently has five superyachts underway at the Ancona shipyard, including the 74m CRN 131, 55m CRN 134, a Ferretti Custom Line CL 124, the 61m CRN 133 and the Riva 122 Mythos, which are at the delivery stage.